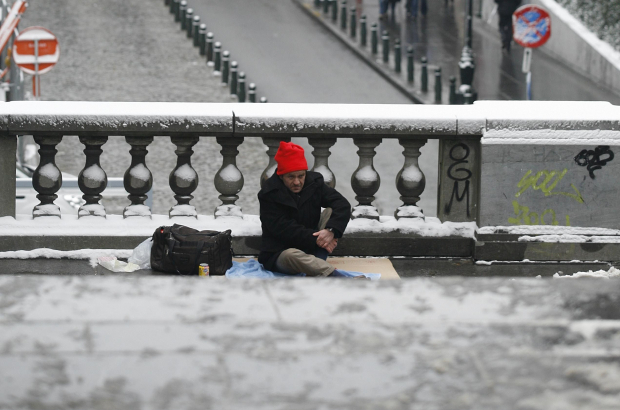 An extra 300 spaces in Brussels shelters are due to be made available to homeless people this week as temperatures plunge below zero - with snow forecast for the capital on Tuesday. The first snowflakes are expected in western Belgium around 6.00 on Tuesday morning and in Brussels around 8.00 or 9.00, affecting both the morning and evening rush hours. Temperatures in Brussels will not exceed 2°C on Tuesday - and overnight frost and ice will also lead to difficult driving conditions on Wednesday morning. A spokesman for Belgian rail infrastructure operator Infrabel said the impact on train services should be minimal. "In 10 years, we've only really had problems with the snow once," he said. "That was in March 2013 when a strong wind was blowing and piles of snow stopped the points working." The federal government's homeless shelter in Etterbeek has increased its capacity from 250 to 300 to cope with the cold snap. A new Samusocial winter shelter in Evere is due to open this week, with 300 extra places, pending the all-clear from safety inspectors. A Samusocial spokesman said: "It was time to open more places, because these last few weeks we've had to turn away between 10 and 40 people on some evenings."